Windmill 1 - the most often seen. Round headed door. H&H 1. Windmill 1a - slightly later variant showing more detail and having a square headed door. Windmill 2 - also recorded on an unmarked jug dated 1820. H&H 2. Windmill 3 - only recorded on one marked jug, this sprig is a variant of one previously associated with the successors to Sanders. H&H 4. Windmill 4 - this windmill appears on a number of items dated in the 1840s. H&H 6. 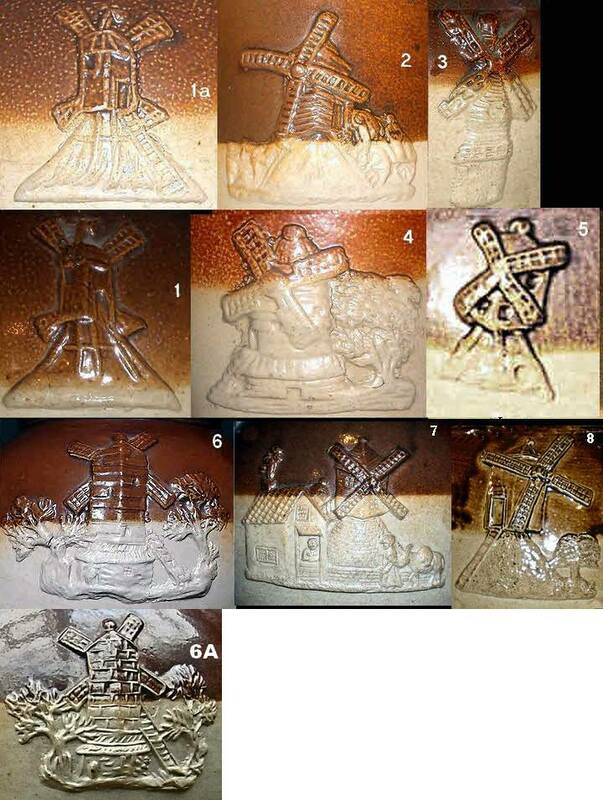 Windmill 5 - six examples seen: four jugs, three marked “Kishere” and one with 1819 hall marked lid and two unmarked tankards. Not in H&H. Windmill 6 - seen on two marked jugs, at least 5 unmarked jugs and one unmarked tankard. Not in H&H. Windmill 7 - this is presumably the windmill described by J.E. Anderson in his book on the Mortlake Potteries (1894) as appearing on a jug given to him by a member of the Kishere family. It has been seen in conjunction with the acorns sprig confirmed as Kishere. Note the absence of chickens outside the cottage. The plaster mould in Mortlake Church is the same. H&H 5 is incorrect in showing the variant, with chickens, (and man leading donkey) used by Doulton, Port Dundas and T. Smith. Windmill 8 – this is presumed to be H&H 3. Robin Hildyard has recorded it on a tobacco jar (ex Tait collection) and a hunting jug with 1809 hall marks. Neither had any obviously Kishere sprigs hence his suggestion that it could be Sanders. I have seen it on two jugs both with 1809 hall marks, one with the third punch party variant panel (q.v.). I am not yet convinced that these items are by Kishere or Sanders. I favour Glasgow’s Caledonian Pottery.